Senate leaders reached a deal today that holds the promise of breaking the partisan standoff over federal spending. Majority Leader Mitch McConnell announced the deal on the Senate floor. MITCH MCCONNELL: No one would suggest it is perfect, but we worked hard to find common ground and stay focused on serving the American people. KELLY: It is a two-year deal, and it would increase spending by $300 billion over those next two years. NPR congressional correspondent Susan Davis has the details, and she joins us now. Hey, there. KELLY: So does this mean maybe we won't be here talking every few weeks about yet another looming government shutdown? DAVIS: I think it might. You know, the Eagles won the Super Bowl, and we get a budget deal. DAVIS: This is a much more positive week than I anticipated. KELLY: For you at least - (unintelligible) Eagles. DAVIS: You know, the goal (laughter) here is certainly to break that cycle of short-term funding bills and shutdown threats that we've been living in since September. It will give Congress the roadmap they need to pass all of their annual spending bills and bring what they hope is a little sanity back to the budget process. They will have to pass one more stopgap through March 23. And at the end of that, they intend to pass the longer-term spending bills. KELLY: Well, let's unpack what's in this deal. It increases money for the Pentagon. It also increases domestic spending. So that's a win in there for Republicans who want more military spending, also a win in there for Democrats who say they want more domestic spending. What else is in there? DAVIS: Also tucked into this, it's going to include another $90 billion about in emergency spending for ongoing disaster relief related to the hurricanes and the wildfires we've had in recent months. It will also include a one-year increase in the debt limit through March of 2019. The debt limit, as we've said before, is essentially like the nation's credit card. Congress needs to periodically vote to increase it so the country doesn't default on its debts. The White House has already announced support for this deal. In particular, the additional military spending in there has been a top priority for President Trump. This deal includes $26 billion more than he even asked for in his budget. Spokeswoman Sarah Huckabee Sanders today said that the president believes this bill will achieve, quote, "the strongest military we have ever had." Democrats have some wins in here, too. There's more funding to combat the opioid crisis, to pay for veterans' health care. And they secured 10 years of funding for the Children's Health Insurance Program. KELLY: ...Deal would - as you're telling me, it would OK hundreds of billions in more spending. And that's just a few months after lawmakers OK'd a tax cut that is going to bring in a trillion dollars less in revenue. How is that going to work? DAVIS: The cost of this two-year spending bill, if you can believe it or not, is higher than anything Republicans ever supported under a Democratic president - President Obama. The combination of these tax cuts and the spending could potentially add up to even more economic stimulus than they ever approved under President Obama. You know, I asked this question to Republicans today. Can you still say you're the party of fiscal responsibility? New York Republican Chris Collins told me that Republicans think this is a bit of a bitter pill, but they still believe those tax cuts will pay for themselves in economic growth. And a lot of conservatives like - North Carolina Republican Mark Meadows told me today he will not vote for this even if President Trump calls him and asks for his vote. KELLY: So have all the deficit hawks in Congress got up and flown? DAVIS: You know, I always say deficit hawks are much louder when they're not in the majority. KELLY: Wow. What about on the House side? I mean, this is a Senate deal. What are its prospects in the House? DAVIS: You know, House Minority Leader Nancy Pelosi has said she will not support the deal, although it is still expected to pass with some amount of Democratic support. She made a pretty dramatic stand against the bill today speaking for hours and hours in protest because they're moving forward on a budget deal without an immigration bill. 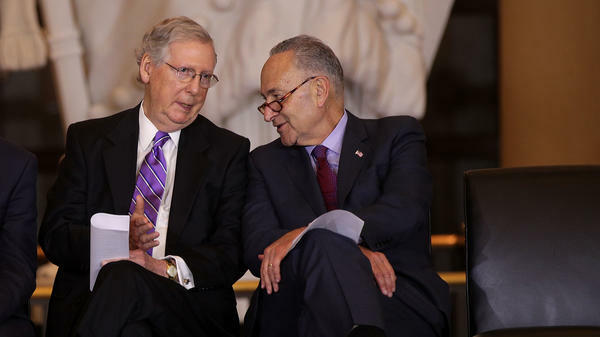 What we do know is that the Senate will turn next to immigration, and Senate Majority Leader Mitch McConnell says he'll have an open debate and see what they can pass in the Senate. KELLY: Susan Davis, thank you. KELLY: NPR congressional correspondent Susan Davis. Transcript provided by NPR, Copyright NPR.